This article focuses on how to integrate SilverPop Engage 4 in .NET. used in sending an email as well as it provides the support for campaign management through various things. By using SilverPop Engage we can send an email on scheduling basis like hourly,daily,weekly,monthly etc. SilverPop Transact provides the facility to send an email for some triggerring mechanism like user registered successfully,etc. SilverPop is like the other products as well with some additional features. There are few documents which help us to configure the SilverPop for our needs. steps we can easily shoot an email or create emailing template for our need. In short this document describes SilverPop's emailing process in detail. required to send an email by using code. If any user uses SilverPop for fulfilling their emailing needs then here is the way to integrate the same in application. These interfaces are useful in authenticating with the tool. Login API used for authenticating with Silverpop. Before calling any other interface we need to get authenticated first by using Login interface. SESSIONID which will be used for making call to Silverpop's interface(s). Logout API used for closing the established session with Silverpop. If Silverpop successfully logs out the user then it will return SUCCESS=true. As the name is self explanatory, this interface used to add new contact to an existing database. of the fields which uniquely identifies the row in that database. LIST_ID : The ID of the database to which you are adding the contact. COLUMN : XML nodes defining the column name and value for fields being added or updated. 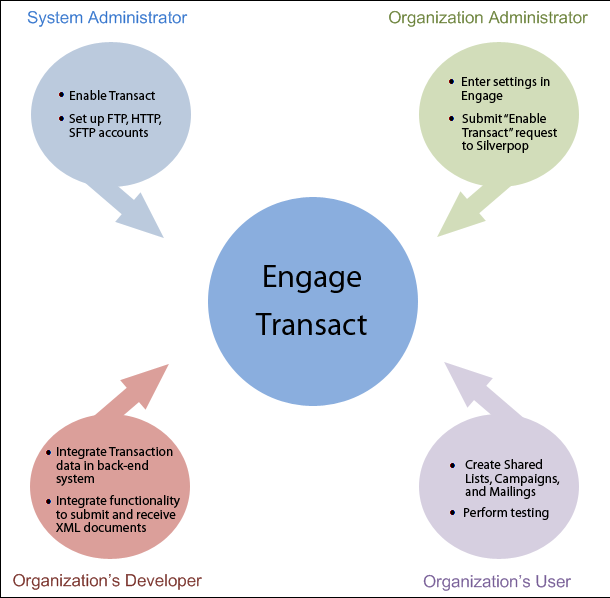 Engage sends the confirmation when the contact is added to the database. AddListColumn API is used to add new column to an existing database. LIST_ID : The ID of the Engage database the column is being added to. COLUMN_NAME : The name of the column being added. GetLists API is used to extraxts a list of databases. VISIBILITY : Defines the visibility of the databases to return. AddContactToContactList API is used to add new contact to contact list. CONTACT_LIST_ID : The ID of the Contact List to which you are adding the contact. CONTACT_ID : The ID of the contact being added to the Contact List. COLUMN : Required if the database has a key other than Email or no Unique Identifier and Contact Id is not provided. ExportList API is used for exports contact data from a database, query, or contact list. LIST_ID : Unique identifier for the database, query, or contact list Engage is exporting. ALL – export entire database. OPT_IN – export only currently opted-in contacts. OPT_OUT – export only currently opted-out contacts. UNDELIVERABLE – export only contacts who are currently marked as undeliverable. DATE_START : Specifies the beginning boundary of information to export. DATE_END : Specifies the ending boundary of information to export. GetListMetaData API is used to fetch the details about the database, list or query. LIST_ID : Numeric identifier for the entity Engage is exporting. SelectRecipientData API is used retrieve the information about a contact from a database. LIST_ID : ID of the database to which the contact belongs. EMAIL : The contact email address to look up. ListRecipientMailings API is used to fetch the recipients mailings. LIST_ID : Unique ID of the database or query whose mailings you are requesting. RECIPIENT_ID : Unique ID of the contact for whom to look up mailings. //Here we have all the details about the mailings for the specified recipient. RemoveRecipient API is used to remove a contact from a database or contact list. LIST_ID : Unique ID of the database or Contact List from which to remove contact. EMAIL : Email address of the contact to remove. CreateContactList API is used to create a new contact list. DATABASE_ID : The Id of the database the new Contact List will be associated with. CONTACT_LIST_NAME : The name of the Contact List to be created. VISIBILITY : Defines the visibility of the Contact List being created. UpdateRecipient API is used to update an existing contact in a database. LIST_ID : The ID of the database to which the contact resides in. COLUMN : XML nodes defining the column name and value. OptOutRecipient API is used to move a contact in opted-out state. LIST_ID : Identifies the ID of the database from which to opt out the contact. EMAIL : The contact email address to opt out. CreateTable API is used to create a relational table. TABLE_NAME : Defines the name of the new table. COLUMNS : XML nodes defining the table columns you are inserting/updating. DeleteTable API is used to delete a relational table. TABLE_NAME : Specify the folder path and name of the Relational Table you are deleting. TABLE_VISIBILITY : Defining the visibility of the table you are referencing. Required if not specified in TABLE_NAME. EMAIL : Engage sends notification to the provided email address when the job is complete. InsertUpdateRelationalTable API is used to insert/update relational table data. TABLE_ID : The Id of the Engage Table that will be updated. ROWS : XML node containing ROW elements for each row being inserted or updated. ExportTable API is used export relational table data into CSV file. TABLE_VISIBILITYSpecified : Identifiies whether table visibility is specified or not. PurgeTable API is used to delete relational table data. TABLE_ID : The Id of the Engage Table you are deleting. TABLE_IDSpecified : Identifiies whether table id is specified or not. DELETE_BEFORE : Only data last modified before the specified date/time will be purged. CalculateQuery API is used to calculate a query size. QUERY_ID : ID of the Query to be calculated. DeleteRelationalTableData API is used to delete records from a table. ROWS : XML node containing ROW elements for each row being deleted. JoinTable API is used to associate a database with a relational table. LIST_NAME : Specifying the folder path and name of the database you are associating. LIST_VISIBILITY : Defining the visibility of the database you are referencing. Required if not specified in LIST_NAME. LIST_VISIBILITYSpecified : Identifiies whether list visibility is specified or not. AddContactToProgram API is used to add a contact to a program. PROGRAM_ID : Unique ID of the program. CONTACT_ID : Unique ID of the contact being added to the program. The GetSentMailingsForUser API is used extract a list of mailings sent for the user for a specific date range. DATE_START : Required Starting Date in the format "mm/dd/yyyy hh:mm:ss"
DATE_END : Required Ending Date in the format "mm/dd/yyyy hh:mm:ss"
// Here we have all the details about the mailings for the specified user. The DeleteJob API is used to remove the job from Engage. JOB_ID : Identifies the Background Job to remove from Engage. GetSentMailingsForList API is used to fetch the send mailings for a particular database for specified date range. LIST_ID : Required ID of the Database or Query for which to retrieve mailings. GetSentMailingsForOrg API is used to fetch the sent mailings for an organization for specified date range. // Here we have all the details about the mailings for the specified organization. GetReportIdByDate API is used to fetch the report ids for provided mailing id for specified date range. DATE_START : Specifies the beginning boundary of information to receive. If time is included, it must be in 24-hour format. DATE_END : Specifies the ending boundary of information to receive. If time is included, it must be in 24-hour format. EVENT_DATE_START : Specifies the beginning boundary of activity for information to receive. EVENT_DATE_END : Specifies the ending boundary of activity for information to receive. EMAIL : If specified, the provided email address receives notification when the job is complete. COLUMNS : XML node used to request list columns to export for each contact. SendMailing API is used to automate a send mailing to user on particular event. MailingId : Identifies the mailing Engage will send. RecipientEmail : Identifies the targeted contact's email address. GetMailingTemplates API is used extracts a list of shared or private mailings. VISIBILITY : Defines the visibility of the mailing templates to return. PreviewMailing API is used to view a preview of mailing. MailingId : Numeric identifier for the mailing template to be exported. ScheduleMailing API is used schedule a mailing. TEMPLATE_ID : ID of template upon which to base the mailing. LIST_ID : ID of database, query, or contact list to send the template-based mailing. MAILING_NAME : Name to assign to the generated mailing. SEND_HTML : If this element is present, value is true. Leave blank if you do not want to include the HTML body. SEND_AOL : If this element is present, value is true. Leave blank if you do not want to include the AOL body. SEND_TEXT : If this element is present, value is true. Leave blank if you do not want to include the text body. SUBJECT : Subject of the mailing. FROM_NAME : From name of the mailing. FROM_ADDRESS : From address of the mailing. REPLY_TO : Reply to address. If this element is not included, the mailing will be sent immediately. ExportMailingTemplate API is used to export mailing template. TEMPLATE_ID : Numeric identifier for the mailing template to be exported. windows mail sent from gmail to other mail using windows application. Good article, nice work. Keep posting.